Innovative pipe and profile extrusion lines are an essential component of any plastic manufacturing process, and the equipment that you choose needs to meet the full scope of your facility’s operation. At Arlington Machinery, we offer innovative pipe and profile plastic extruders, along with plastic sheet extrusion equipment, to manufacturers throughout the nation—providing your business with the efficiency, production capabilities, and high-value quality you need to increase overall performance. Pipe extrusion lines are commonly used to create PVC pipes and precision tubing, while profile extrusion systems utilize a similar process to produce flat plastic pieces for fencing, decking, and siding. With the pipe and profile extrusion equipment from Arlington, you can customize the size, thickness, and shape of your end product down to the smallest details to ensure a perfect result that meets your high quality standards. Customized End Products: With pipe and profile extrusion machinery that creates everything from flat plastic pieces to perfectly symmetrical piping, we carry a wide selection of options to create the specific end products that you need. Reduced Waste: The precision performance of our extrusion lines ensure that more raw material is utilized with less wastage—saving you money and increasing the profit for your bottom line. Lowered Operational Costs: By handling the intricate stages of pipe and sheet extrusions, our plastic extrusion machinery is a high-value investment that reduces overhead costs. 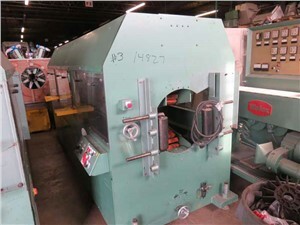 Streamlined Production: At Arlington Machinery, we sell plastic extruders in as-is and a fully refurbished condition to give you the efficient and safe production operation that you deserve. As a trusted name for buying and selling of plastic extrusion lines, Arlington Machinery has the solution that you need for maximum efficiency and performance in your manufacturing application. Learn more about the pipe and profile extrusion lines that we offer today by giving us a call to speak with an experienced representative, or request a quote now by submitting our brief, online form.